I will have to take back my jubilant announcement last week about Monday's preeminent opening of Double Shots Espresso Bar - sorry to all the folks that headed over there for some coffee and found it still closed. The owners have promised it will be open Wednesday, but I'm not holding my breath until I see the "Open" sign up in the window! Danforth East has gone way too long without a good gym, so the good news of the week is that the new Good Life Fitness at Coxwell & Gerrard that has been under-construction for at least two years now, is finally ready to open. I walked by yesterday and noticed the doors were open. Some very handsome gents in Good Life shirts said I could come in and sneak a peak, which is what I did until a ferocious employee kicked me out with a firm “Come back on Thursday” before she shut the door. But what I did manage to observe, before being so unceremoniously evicted, is that this is going to be a great gym. Lots of cardio machines and a nice layout with two levels. I haven’t confirmed the rumour that there will be babysitting. They’re having an open house on Thursday evening from 5 – 9. Anyone is welcome to drop in. It officially opens for workouts on Friday morning (May 1). Yippee! You can call (416) 466-8699 for more info or email them at: torontocoxwell@goodlifefitness.com. This neighbourhood is going to the dogs...literally! Danforth East-ers love their dogs but we all have pretty tiny backyards, thus the need for rockin' dog parks for our pooches to be ruff n' tumble in. We already have part of Monarch Park but the big news of the week is that a neighbourhood association has banded together to have the Merrill Bridge Road Park (map here) turned into an off-leash zone for our fur babies to roam in. The Parks and Rec people have approved the application and I believe that it will now just come down to a meeting to discuss the official details. It was supposed to happen on the 29th, but has been postponed. I will keep everyone posted. Last Saturday there was a rash of garden shed break-ins on Springdale Avenue east of Coxwell. Yesterday a house on Milverton was broken into in broad daylight. The police canvassed the neighbourhood but there were no witnesses and the owners say that they didn't think anything was stolen. Needless to say, recessions can often be the catalyst for crime (desperate times, desperate measures, etc.) so be careful and make sure you lock your doors and windows! After tips from two readers about a mysterious coffee shop in the works, I decided to investigate yesterday. 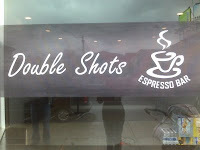 What I found out is: Double Shots is a new espresso bar opening at 1832 Danforth (next to Aetna). The co-owner Sam came out to chat - could have been because I was suspiciously lurking and snapping photos in the pouring rain. The pencil behind his ear and painting scrubs indicated that it looks like they're still cleaning up the joint, but he did mention that they're hoping to open Monday, April 27th. I forgot to ask what they'll be offering other than delicious, caffeinated treats, but we'll all find out next week. Disclaimer: I have to mention that I think Seb's makes the best cappuccino on Danforth. If you haven't tried it, don't be afraid of the large crowd of smoking men out front. It's worth a visit! 'Not far from the tree' is coming to our 'hood. 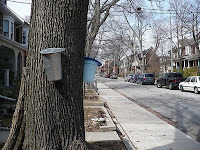 They are a really neat not-for-profit that picks fruit (and taps maple trees!) in people's yards and distributes it to local groups who can use it. Here is a Toronto Star story written about the group. They are working with the Shoelace Collective -- a group working out of the Woodbine Heights Baptist church (Woodbine and Sammon). They've started to register trees and are already hitting the ground. More info at info@notfarfromthetree.org. On my daily walk today, I noticed a new storefront opening which seemed to be causing quite the excitement in people passing by. A new spinning studio called Legacy Indoor Spinning Studio is apparently going to be opening at 1506 Danforth, just west of Coxwell (directly beside Cyclepath). They are offering free classes April 27th - May 1st and May 4th - May 10th at 5:30 every night. Call to book, I guess: 647.351.SPIN. This is exciting - my take is that this is just another sign of the times, that the neighbourhood is starting to cater more to the newer and younger residents. Regardless, free spin classes close to my house is a bargain I can't refuse! 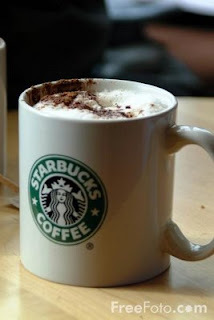 In honour of Earth Day, Starbucks is giving away free coffee on Wednesday, April 22nd. The catch is that you have to bring your own mug! Nearest locations to Danforth East are: Danforth and Jones OR the Beaches location at Queen and Brookmount (if you want a nice walk!). I live close to S. Walter Stewart library which is the closest library to the old "downtown" East York. 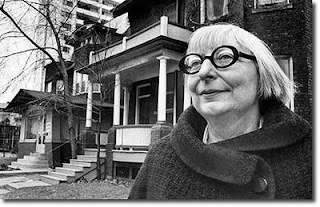 It dawned on me that there would most likely be a great selection of books and reference material, including archive photos, from East York over the years. I'm a history nut and I love old maps, old photos and old personal accounts of Toronto, so one day last fall this is where I headed. The reference librarian pointed out the motherload: a whole East York section! Plains Ave was once the northern most boundary across the east. O'Connor Drive was only begun once the bridge across the ravine (east of Woodbine) was completed in 1932. The reason it is named O'Connor Drive is because the man who owned the lands at Victoria Park and O'Connor was instrumental in helping to erect the bridge. He was the owner of the Laura Secord Candy chain and had a great many political connections - thus a street name marks his contribution to East York forever. I've lived in East York now for a cumulative life total of 5.5 years. For the past 1.5 years I've been nesting at Coxwell and Danforth and starting a family. What I've learned about this side of the Danforth is that it's full of hidden potential. It feels like an old time neighbourhood - where else in the city would I run into people I know whenever I'm out for a walk? And at first glance, one may not give a second thought to some of the storefronts on our strip, but there are great restaurants and shops that just need to be discovered by new members of the community. Thus, the title of this blog: I feel like I'm a bit of an east end pioneer, trying new things and discovering new territory. I'll be posting news, neighbourhood happenings, restaurant reviews and other things. So enjoy, and please feel free to pass on news, events, garage sale postings, etc.